Just in case there wasn't enough speculation surrounding the new iPhone and iPad, the latest rumor has it that Apple will release them along with a whopping six other new products this year. According to Apple Insider, Ming-Chi Kuo from KGI Securities suspects that Apple will add new models to its iMac, MacBook Pro, and iPod lines throughout the fall. It will start in September, with the oft-rumored September 12 event where Kuo believes Apple will announce a new 21.5-inch iMac and a 13-inch MacBook Pro with retina display. While the new iMac isn't expected to have a retina display, it will reportedly feature a brand new design as its main draw. September will also supposedly see the release of the highly anticipated iPhone 5 and a new revision to the iPod Touch. No details were revealed on what to expect from the new iPod Touch, but it will likely carry many of the same improvements and new features as the new iPhone. October is expected to be equally busy for Apple, according to the same KGI Securities report. Early in the month Apple is expected to launch a new iPod Nano with wireless capabilities to download music directly from the iTunes store. Much has been said already about the rumored iPad Mini, and according to KGI Securities a new regular-sized iPad will join it on store shelves in October. The new iPad will reportedly remain essentially the same as the current model, with the key difference coming from support for the new smaller dock connector that will be introduced with the iPhone 5 and iPad Mini. Apple's final new product will be a new 27-inch iMac. The new iMacs are expected to use a new "full lamination process" to fuse the display panel with the glass. However, the process is apparently more taxing for a larger 27-inch display than for the 21.5-inch model, which is why KGI Securities believes the larger model will launch in October rather than September. 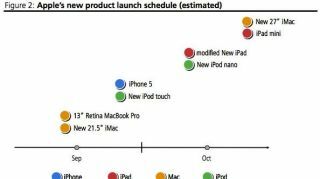 KGI securities paints an impressively full schedule lined up for Apple. Of course, it all comes without official word from Apple, so we'll have to wait until the September mystery event to see how it all pans out.